It is certainly starting to feel like summer on the farm, especially when we spend afternoons by the river and snack on peas, greens and strawberries out in the field! It only gets better from here friends! Garlic scapes are one of my favorite seasonal treats. 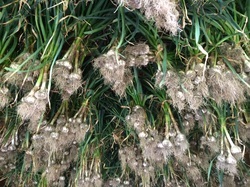 Scapes are delicious in any egg dish, but we use them everywhere in place of garlic, they are great on the grill too. Dandelion greens are a super healthy slightly bitter green, they are good in salads, juiced and also cooked. Try them in this quiche I made the other day! Sautee the garlic scapes in butter or olive oil for about 2 minutes, then add in dandelion greens and turn off heat, this should be enough to wilt the greens. Spread the rice evenly around the bottom of your pie crust, then layer the scapes and greens over that. Top with both cheeses. Whisk together the eggs and milk adding in salt and pepper as you like it. Pour this into the pie crust. Bake for around 40 min until puffy and golden brown. Spring got off to a slow start this year, but the past couple of weeks have been near perfect growing conditions. Warm sun, not too cool at night, and just the right amount of rain. The plants just love it and so do we! Kale or Rainbow Chard, Spring Garlic, Radish or Hakurei Turnips, Lettuce, Baby Bok Choy, Shoots and your choice of Herb. 3T fresh herbs- I used cilantro & thai basil. In a large frying pan sautee the garlic in oil for a minute then add in the turnips, once they are tender add the bok choy and sesame seeds. I like to add in a little bit of the tamari at this point too. Let cook until the bok choy is just tender. Toss everything together in a large bowl, adding fresh herbs, enjoy! Put everything in a canning jar and shake it up! This weeks brings the end to our first CSA season. Before it began we didn't know just how wonderful CSA pickup day would be, we just thought we'd harvest the veggies, you would come get them and that's it. But it is SO much better than that! This summer was a little intense bringing former hay fields into production, breaking ground for future fields, establishing wholesale accounts, wrangling a toddler and dealing with all the other usual battles farming entails- like months of rain and insects that are set on destroying everything. That all adds up to us not getting out much (don't worry we make up for it in the winter!) Right now we are bringing in the last of our field crops, cover cropping open fields and preparing our greenhouse which was full of tomatoes all summer for winter greens production. We want to thank you so much for supporting us in our first year we could not have done it without all of you! Butternut Squash is one of my favorite to cook with, I add it to soups, stews, vegetable roasts, lasagna, ravioli, pizza and even burritos! I made this lasagna the other night I'm still going strong with the kale caesar salad, which I will again highly recommend! For butternut squash lasagna I simply use a plain vegetable lasagna recipe as a base. I cut the butternut squash in half, scoop the seeds out and roast it with a little olive oil on the outside and several garlic cloves tucked into each seed cavity. Once it is well roasted I puree it in the food processor with a little parmesan cheese, I like to add spinach kale or chard to the ricotta cheese as well as plenty of herbs like parsley thyme and sage. When I assemble the lasagna I start with tomato sauce in the pan, then as I make the layers I use the butternut squash in place of tomato sauce. On the very last layer I finish with tomato sauce and cheese on top. Enjoy! Don't worry, It's just kohlrabi! I know, it looks weird and no one knows quite what to do with it. But just a little google search brings up plenty of delicious recipes. In the summer we love kohlrabi slaw and slicing it up thinly for our salads. It is also nice in baked dishes like potato gratin. Last night it was so chilly we needed something warm, these spicy fries were delicious and super easy to put together. I used the same recipe with some thinly sliced delicata squash, switching the chili powder out for jerk seasoning. 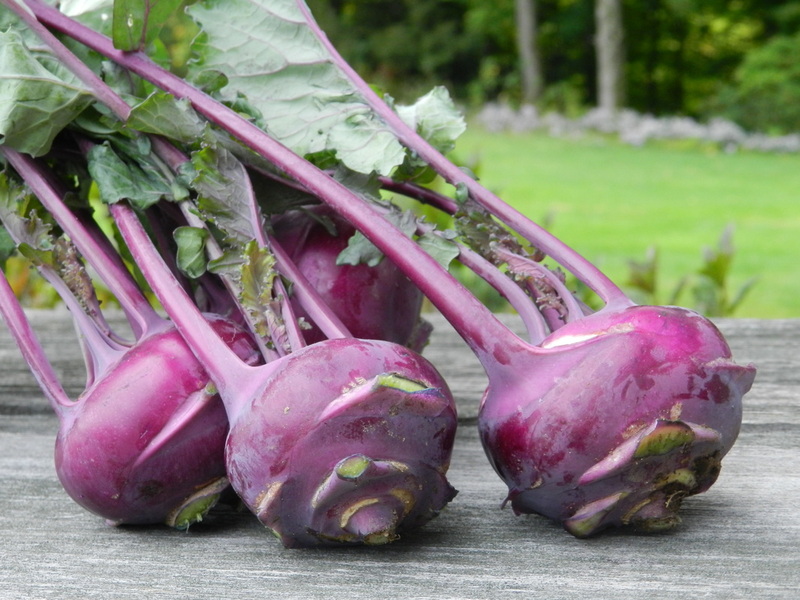 Try it, I'm almost positive you will fall in love with kohlrabi! Preheat oven to 425. Peel kohlrabi and cut into sticks not to0 big or they won't bake well. 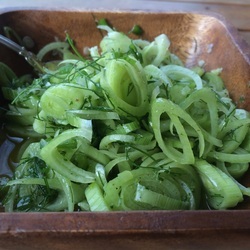 Combine lemon juice, olive oil and tamari in a large bowl, toss with the kohlrabi. Then add in the dry ingredients and stir to coat. Spread out in a single layer on a baking sheet. Bake for 30 minutes or until crispy, turning halfway through. Enjoy! Tonight is the Harvest Moon- which is the full moon closest to the Fall equinox. It is called the Harvest moon because it allows farmers to continue working into the night. Now that we have things like headlamps, blinding 'light of 10 million candle' spotlights and headlights on the tractor, we can work at night anytime...YAY! The past few nights with frost moving in we has been out with our headlamps and headlights and 'light of a million candles' covering up the peppers and basil, the beans and lettuce hoping to protect them from the cold and get a few more harvests to get us through the fall. The tomatoes in our greenhouse have been slowing down quickly over the past week so enjoy these last few rounds of them! I found this easy delicious recipe for stuffed acorn squash, I love it because roasting the squash brings out all the flavor, but the stuffing is added at the very end, so it doesn't get over cooked. Place squash on a baking sheet drizzle with olive oil and salt bake at 425 until tender ~ 45 min. - Sautee the onion and garlic until tender then add in the swiss chard, once it is wilted add the tomatoes and let cook for a few minutes. 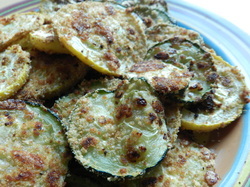 - Fill squash with the vegetables and top with breadcrumbs and cheese. After an amazing meal at The Crop Bistro & Brewery I have been making this Kale Caesar salad almost every day. It's not quite as good as Chef Tom Biven's version but it will have to do until we get over to Stowe again. If you are a bit skeptical of raw kale in a salad I promise this is amazing- the important thing is to chop the kale super fine. This makes a big bowl! Chop kale very finely- like you would cabbage for coleslaw. Put all other ingredients in a large bowl and whisk together. Add the kale in and toss. It's really starting to feel like fall now, especially when you hear meteorologists talking about a frost! It feels a little early, but at this point in the season the thought of things slowing down is pretty welcome. Root vegetables and winter squash will start taking over and spinach and arugula will be back in soon. 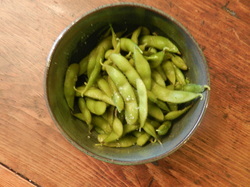 But right now watermelon is super sweet, the corn is amazing, we are fully in the annual tomato glut and we will harvest edamame tomorrow! Still plenty of summer left to enjoy on the farm! Since we are swimming in peppers right now, I decided to make stuffed peppers tonight. - Most recipes tell you to steam the peppers before you stuff them, but we don't really enjoy soggy veggies so I just remove the tops from the peppers and place them in a 13 x 9 or 8 x8 pan and add a little water to the bottom before I stuff them. For the stuffing I use whatever veggies and grains I have on hand. Tonight I used a mix of brown rice & quinoa. I sautéed -onions, garlic, carrots, broccoli, swiss chard, parsley and tomato just until they were tender and the tomatoes nice and juicy. 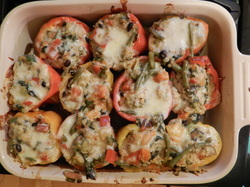 I added grated parmesan cheese to the vegetables and rice and stuffed the peppers and topped them with mozzarella cheese. Enjoy!